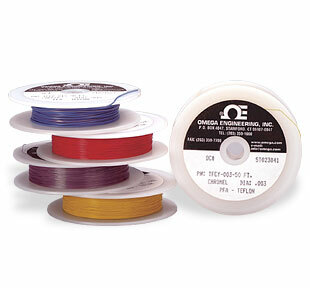 OMEGA's fine gauge single strand thermocouple wire is available in 15, 30, 150 and 300 metre (50, 100, 500 and 1000 ft.) reels. Each reel represents a single conductor for a particular thermocouple type. Wire diameters range from 0.07mm(0.003") up to 0.81mm(0.032"). The wire is covered by extruded PFA insulation. The insulation thickness is 0.08 mm (3 mil) for wire sizes equal to and less than 0.25 mm (0.010"). For wire sizes greater than 0.25 mm (0.010"), the insulation thickness is 0.2 mm (8 mil). mm (") Model No. Alloy/Colour Code Wire Dia. †Constantan is matched to either iron, copper or Chromel (CHROMEGA™). When ordering “matched pairs,” be sure to specify TFCI with TFIR, TFCC with TFCP, or TFCC with TFCH. Below are some examples of typical part numbers. To order a specific part number not shown below please use the Part Number Builder beneath the To Order box. Nota: *Constantan is matched to either iron, copper or CHROMEGA ® When ordering “matched pairs,” be sure to specify TFCI with TFIR, TFCC with TFCP, or TFCC with TFCH. *Constantan is matched to either iron copper or Chromel (CHROMEGA™). When ordering matched pairs be sure to specify TFCI /TFIR or TFCC /TFCP or TFCC / TFCH.